A universal all-in-one canopy slide mount that features a pivoting hood bar mount and a locking thumb screw on a rail that slides into the canopy slide track. The stainless steel universal slide unit is an all-in-one canopy (hood) bar slide unit. 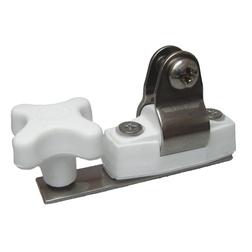 It fits into the stainless steel canopy slide track and has both a locking screw and pivoting mount all in a single slide mounting. The pivoting mount means that the slide unit can be used either way round, on either side of the boat and either vertically or horizontally mounted making it completely universal.